And behind it all is the Thorn Queen. Mysteriously magnetic (or murderously vengeful, depending on whose side you’re on), she is always one step ahead of them . 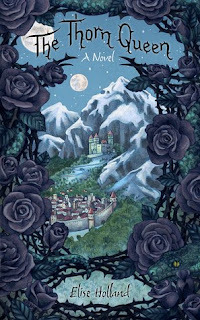 . ."
The Thorn Queen is a delightful middle grade fantasy adventure novel filled with imaginative characters, magic, and world-building. Our protagonist is Meylyne, a young girl who is suddenly thrust into a much larger role in her world than she ever anticipated--or wanted. Meylyne is a bold, endearing girl who is not so great at performing her Alchemy magic and is also shunned by most of society for being half human/half garsyle, while they are all full garsyle. Meylyne is a great character, full of her own ideas and the penchant for being strong-willed, but she also has many insecurities and struggles with trying be a normal kid. We meet many other characters along the way that made this book a true delight: Grimorex, an unexpected ogre; Blue, an accidentally one-foot tall boy; Hope, a stallynx; and so many more! I found Holland's characters to be wonderfully developed and each had a really interesting personality that always seemed to surprise me. I would say that characters are one of Holland's strong points in writing, as she managed to mostly stray from stereotypes--besides one villain-type character--and create her own roles for them. Another area that Holland does really well is her physical world-building. Glendoch is a world that I would love to see because of how beautiful it sounds. This is one of those books where I would love to have more illustrations and artwork of some of the locations featured, particularly some of the castles. As much as I loved the descriptions of the world itself, I did have some issues with the intricacies of how the world itself was organized--mainly that there wasn't enough explanation. I understood the basics of how the world was set up (the 'Above-World,' etc. ), but I didn't understand the why or how the places were developed in the first place. This leads me to one of my biggest issues with this book which was simply how complex the politics and secrets were. There were a lot of info-dumping conversations between characters that were actually a little difficult to keep up with at times, which isn't something that normally pops up in middle grade books. Overall, I enjoyed The Thorn Queen a lot and found it really inventive, so I've given it four stars! I am unsure whether or not there will be more books, but if there are then I will certainly read them and see what adventures Meylyne is up to next.